The fourth highest mountain in the world, Lhotse is situated just around 3 km south of Mount Everest separated by south Col. 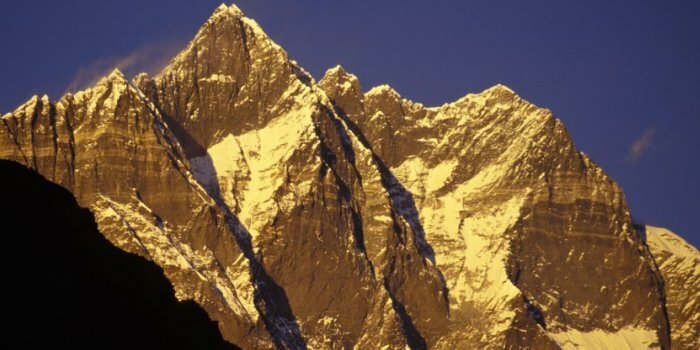 The Lhotse East or middle, Lhotse Shar and Lhotse are the main three main peaks that make up the Lhotse massif. The South Face of Lhotse is the most technical face of Lhotse which is also one of the largest mountain faces in the world. The most difficult part of climbing this mountain is undoubtedly the Khumbu Icefall. After quite a few unsuccessful attempts on the mountain, the South Face was eventually successfully climbed in 1984. As both Mt Everest and Lhotse share the same base camp Lhotse can be climbed either from Everest Base Camp or nearby Chhukung. Lhotse Expedition encounters many obstacles including high altitudes, unfavorable weather conditions and exhaustion. However we believe that our planning, logistics, staffing and decade-long experience coupled with your enthusiasm and determination would help you achieve your lifetime dream to conquer this massive mountain. Day 04: Fly to Lukla (2800m) / trek to Phakding (2640m) / overnight tented camp. Day 05: Trek to Namche Bazaar (3446m), overnight tented camp. Day 06: Rest and Acclimatization day at Namche. Day 07: Trek to Khumjung (3790m), overnight tented camp. Day 08: Trek Tengboche Monastery (3867m), overnight tented camp. Day 09: Trek to Pheriche, overnight tented camp. Day 10: Trek to Lobuche (4900m), overnight tented camp. Day 11: Trek to Lhotse base camp, overnight tented camp. Day 48: Cleaning up Base Camp, overnight tented camp. Day 49: Trek to Pheriche, overnight tented camp. Day 50: Trek to Khumjung, overnight tented camp. Day 51: Trek to Phakding, overnight tented camp. Day 52: Trek to Lukla, overnigh tented camp.